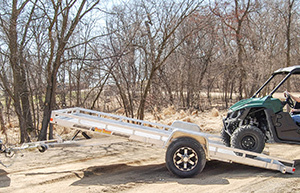 Bear Track Products, an aluminum trailer manufacturer, launched an all-new lineup of aluminum tilt utility trailers. The new line of tilt trailers includes five models with carrying capacities ranging from 2,340 and 4,115 pounds. The utility trailers operate using a hydraulic damper and gas spring. The aluminum tilt utility trailer line is available at dealers now.